It’s that time of the year again in Sweden. Time to worship our sweet tooth and begin the fasting period of Lent. In Sweden we take Shrove Tuesday (more well known as Mardi Gras or Fat Tuesday) seriously. We eat semlor. We buy 4 million semlor on this day. We each marzipan on cardamon flavored bread with whipped cream. And more semlor. And the heretics eat semlor with blåbärs creme (blueberry creme). This is obviously the best way to start the fasting period, eating delicious goodness. I suppose we can make an exception for waffle day. A semla is more than just a bun to the Swedes, it is heaven. And with anything heavenly, I asked Twitterers and friends to give their take on the semlor. Can you name a favorite part? Is that possible? The beautiful blen of crushed almond sugar paste not quite marzipan mixture with slightly sweetened whipped cream surrounded in a fluffy pillow of cardemom flavored puff pastry? The best Fat Tuesday celebration pastry I’ve ever had. I’ve been known to scoop the cream out with my finger and leave the rest so I guess that’s my answer! The whipped cream! Unless it’s from Lux Dessert & Choklad who make an amazing mandelmassa….mmmm! Semlor from Gunnarssons Bakery on Götgatan 92 in Södermalm. Left is the “special” semla which has mixed whipped cream and mandelmässa. Right is the “lux” which is very luxurious and creamy. Semlor’s traditions date back to the 1500s during the Protestant Reformation. At that time it was a simple bun served with warmed milk (hetvägg). In the 1800s Swiss bakeries introduced the almond filled paste into the bun. And by 1930, by ways of Gotland, whipped cream was added to fulfill the decadence. 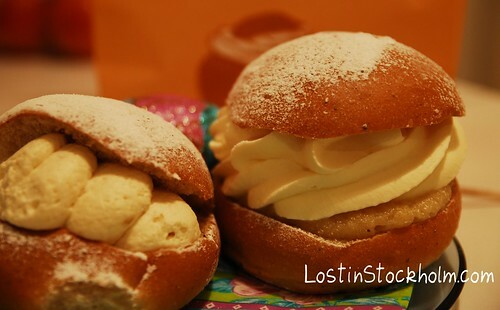 Want to find the best semlor in Stockholm? Check out Kakbloggen‘s top list and from SVD. In Gothenburg check out GP for their best of list. Or to make your own semlor, here’s a great recipe from DN. What’s your favorite way to eat a semla? And your favorite part? It’s okay we won’t hate you if you don’t love semlor, okay maybe we will. PS- It is International Women’s Day. 60 million women are sexual abused on the way to school, more than 40 million are estimated missing in India due to honor killings or infant murder. Please honor the women in your life. Thank you thank you thank you! 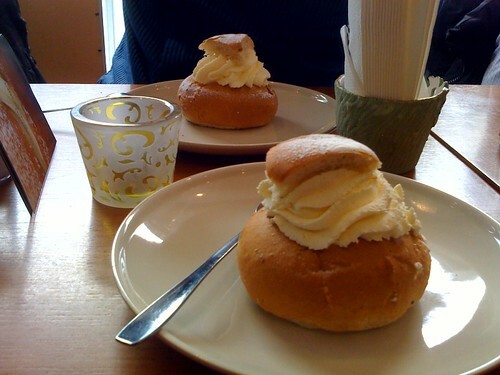 My Swede had no idea what Fat Tuesday was, except that you eat semlor! I finally gave up on him but so glad you enlightened me, lol! Uploaded a great semlor recipe our friend baked for us that I recommend if you are in the mood for baking. Next year I will be more prepared and make some myself! ooh they look sooo good. I know my man is craving, craving, craving Semlor since he can’t get them here. Except at the local Ikea which are probably not really the best ones. I’m going to send this post to him. Pingback: Best Semlor in Stockholm – Bästa av Bästa! Previous Previous post: The World’s Happinest Nations: Damn You Denmark! Next Next post: Married? Life is Short. Have an affair.